The Crook County Cowboys were riding high heading into the league season. 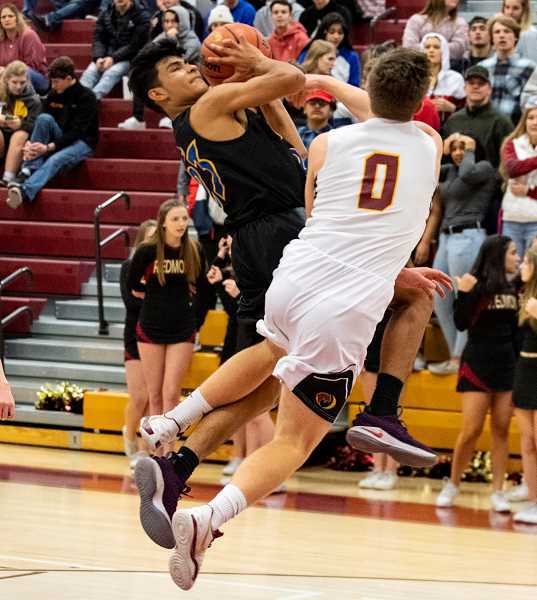 Crook County started the season with three consecutive wins, and despite playing a murderous road schedule, the team still had an 8-6 record as they headed into the Intermountain Conference schedule. Since then, nothing has gone right for the Cowboys. Heading into Tuesday's game at Redmond, the Cowboys had dropped four of their last five games, falling to 9-9 overall on the year and just 1-3 in conference play. Still, Crook County was optimistic heading into the contest. After missing players each of the last two games, the team was once again at full strength. Adding to the optimism, the Cowboys have played good defense most of the year, while the Panthers have struggled offensively for much of the season. Tuesday night was supposed to be the turnaround game for the Cowboys. Instead, the team was once again disappointed as they played well enough to have a chance to win, but still came out on the short end of a 56-49 loss to the Panthers. "It was disappointing," Crook County head coach Darin Kessi said. "When we defend like we can, we were really good, but there are times when we just aren't fully committed. We are still searching for that complete game." In what turned into a game of streaks, the Cowboys outscored the Panthers in three of the four quarters but still were unable to find a way to win. Redmond jumped out to an early 3-0 lead on a three-pointer by Dylan Moss. The Panthers led 10-5 late in the first period before Crook County came to life offensively. Crook County scored the final six points of the first quarter, the final two coming on a pair of free throws by Kevin Sanchez with just .03 seconds remaining on the clock. Just when it seemed like Crook County had all the momentum, the game was delayed for several minutes for a scoreboard malfunction. Every time the clock operator tried to reset the score to 11, a new triple digit number appeared on the guest side. At one time, the scoreboard read Home 10, Guest 112. After turning the clock off and completely resetting it, the score was finally corrected and play continued. Redmond scored the next five points, pulling out to a 15-11 lead. When Devin Bishop hit a basket with 4:35 left in the second quarter, the Cowboys were within two at 15-13. However, the rest of the second quarter was all Redmond. The Panthers went on a tear, knocking down five three-pointers in the final three minutes of the half as they raced to a 32-22 halftime lead. "We just took some bad gambles on defense," Kessi said. "Skyler Jones knocked down some threes, and we were not good at being there on the catch with Moss in the first half. We were better in the second half." After surrendering 22 points to the Panthers in the second quarter, the Cowboys did a much better job defensively in the third period, holding Redmond to just five points until late in the quarter. The Cowboys were within five at 37-32 when Jones hit another three-pointer with seconds left in the period. 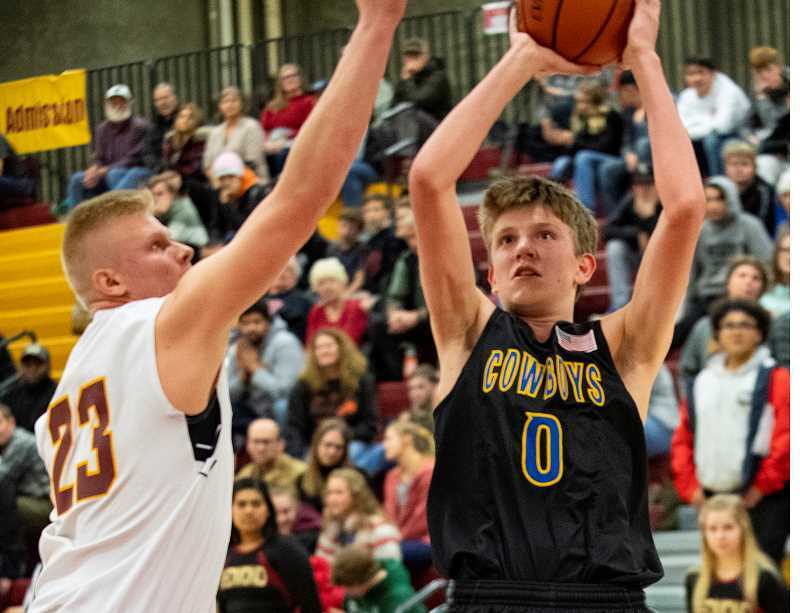 The Cowboys had a pair of three-point attempts of their own at the end of the period, but both came up short, and the quarter ended with Crook County trailing 40-32. Crook County got hot early in the fourth quarter, outscoring the Panthers 11-2. When Thaiden Mullan picked up a steal and Sanchez nailed a three-pointer, Crook County led 43-42 with 5:12 remaining in the contest. "The boys did a great job of showing a lot of grit and togetherness to come back like they did," Kessi said. "They were down quite a bit, and they dug in and battled back. They did a great job of finding a way." Not only did it look like the Cowboys had all the momentum, but Redmond had already committed seven fouls in the half, while the Cowboys had only two. With the foul advantage, it looked like the Cowboys would be shooting free throws the remainder of the game. Instead, after a Redmond time out, Crook County was called for a foul in the low post. Moss made a pair of free throws, and the Panthers regained the lead. The next time down the court, the Cowboys missed a three-point attempt, and Sanchez went high in the air for the rebound. With lots of contact on the play, Sanchez fell to the ground, but no foul was called. Redmond scooped up the loose ball, and Charlie Rawlins made a driving circus shot to put the Panthers up by three. Rawlins was well guarded on the play and threw the ball up from what appeared to be behind the basket. The ball went high in the air, bounced off the front of the rim, flew above the backboard, then hit the board on the way down rattled around the rim and fell in. On the ensuing possession, Mullan hit a driving shot and was fouled on the play. A missed free throw left the Cowboys trailing 46-45. Mullan then grabbed a defensive rebound and drove the length of the court. He appeared to be fouled by Jones, instead he was called for an offensive foul. The call seemed to take all the wind out of Crook County's sails as the Panthers outscored Crook County 10-4 the remainder of the game. "I really felt like Redmond got some of the breaks, and the officiating bothered us a little more than it probably should have there for a few minutes," Kessi said. "They shot a bunch of free throws, and we didn't shoot hardly any, which was a little bit of a bummer because it felt like I was just asking for the same call that they were giving them. They called multiple fouls on us where they threw the ball to the low post, and we were there on the catch, and they turned right into our guy and then Mullan drives down and gets hammered on the drive, and it's not the same thing. Just be consistent." Despite having the Panthers in foul trouble early in the second half, the Cowboys shot just five free throws the entire contest, while Redmond went 14-19 from the line, with 13 of those free throws coming in the fourth quarter. Moss led all scorers with 26 points. The 6-4 post hit four three-pointers and went 6-6 from the foul line in the game. "We knew that Moss was going to put up shots, but he hit more shots tonight than we were expecting," Kessi said. Jones was also in double figures on the night with 13 points, most coming on long-range jumpers. The Cowboys were led by Sanchez with 21 points. Sanchez also did most of his damage from long range, nailing five three-pointers in the game. Mullan was also in double figures for Crook County with 16 points. With the loss, the Cowboys have fallen to 1-4 in league and 9-10 overall, while Redmond improved to 4-13 overall and 2-3 in league. The Cowboys were originally scheduled to host Pendleton (3-1, 13-5) on Friday. However, due to weather concerns, the game was moved to Thursday night. The game is a must-win situation for the Cowboys if they are going to have any hope of reaching post-season play. Just three teams from the IMC qualify for the playoffs, and Crook County is now two games behind third-place The Dalles. Next up for the Cowboys is a Tuesday night game at The Dalles. "We just have got to get back to work," Kessi said. "You never know what is going to happen in this league." Crook County – Kevin Sanchez 21, Mullan 16, Lowenbach 6, Savage 2, Kessi 2, Bishop 2, Graydon, Langley, J. Sanchez, Humeston. Totals: 19 4-5 49. Redmond – Dylon Moss 26, Jones 13, Rawlins 7, Aamodt 6, Chambers 2, Haigh 2, Browning, McKenzie, Osborne. Totals: 17 14-19 56. Three-point goals – Crook County: Sanchez 5, Mullan 2. Redmond: Moss 4, Jones 3, Rawlins.